What makes a good didgeridoo? Some didjeridus are simply great. Others, well, they make a good souvenir. And between the two there is a huge range of quality. So, what makes the good ones good? In this page we report the results of a collaboration between the Didjshop, an enterprise that has not only a large range of instruments but a large database of careful records, and a team of acoustics researchers who have been studying the acoustics of the didjeridu. This page is designed for musicians. A technical paper published in a scientific journal is referenced below. • What is a good musical instrument? • How does a didjeridu work? • How were the experiments done? • Why study didjeridu acoustics? What is a good musical instrument? This is, in general, an important but subtle question. Answering it on most musical instruments is quite difficult. Because of important psychological factors, the experiments must be done 'double blind' -- neither the player nor the experimenter should know which instrument is being tested. Otherwise their expectations may influence their judgment. If the player knows, from handling the instrument, that it is a student instrument from company A in country X, the player may approach it with an attitude different from that involves in playing an expensive, hand-crafted instrument from company B in country Y. In the former case, the instrument may take the blame for a poor sound. In the latter, the player may try to meet certain expectations and compensate for shortcomings in the instrument -- such compensation is an important skill for a good player. For many instruments, it is difficult to organise a satisfactory double-blind experiment: instruments may readily be identified by different manufacturers, different geometries, different 'feel' and, for some materials such as gold, even by the weight. In many cases, it is difficult even to obtain certain highly esteemed instruments for such a study: if players have spent staggering sums of money on very old and rare Italian violins, are they likely to lend them for an experiment in which they will be judged, double-blind, against a selection of modern instruments, some of which may be excellent? The didjeridu has advantages over other instruments in this regard: neither the player nor the investigator knows what it is like inside. Further, good didjeridus come in a wide range of shapes and sizes (as do bad ones) -- see Figure 1. Finally, the range of quality in didjeridus might be larger than that of other instruments. There is not much point for a group of people to make really poor musical instruments, but the termites have other motives. This page gives an informal account of a scientific study that aimed to relate subjective assessments of the quality of didjeridus to objective, physical properties of the instruments, measured acoustically without a player. The photograph shows some of the instruments measured in this study. From the top, they are classed by the Didjshop as being high concert, medium–high concert, medium concert, medium–low concert, low concert, first class–low concert, first class, first–second class and second class respectively. In this study, their quality rankings were 5, 6, 7, 13, 21, 35, 37 and 26, out of a set of 38 instruments. Evidently, it is difficult to judge the quality of an instrument from looking at it -- which makes a double blind study relatively easy for the didjeridu. How does a didjeridu work? Like the trumpet and tuba, the didjeridu is a lip-valve instrument. In normal use, a standing sound wave in the instrument can cooperate with the vibrating lips to produce a note. The player's lips open, a pulse of air at high pressure flows through them and travels down the instrument, reflects from the open end and returns to the lips. If the cycle of lip vibration matches that of a resonance of the instrument, then the pulse of pressure can assist the lips to open for the next cycle. This determines the playing pitch of the instrument. For more detail about this, see the site on didjeridu acoustics. A tube has a series of resonances with different frequencies. Provided there are no leaks, the losses are usually greater at high frequencies, so the resonances become weaker at high frequency. For most didjeridu playing, only the resonance with lowest frequency is used. The second, and very occasionally higher, resonances are used for 'hoots' at higher pitch. If the didjeridu were cylindrical, like a piece of pipe, these higher resonances would be roughly a musical twelfth (octave plus a fifth) and a major seventeenth (two octaves plus a major third) above the lowest note. Usually, however, the intervals are somewhat smaller than this, due to the flare in the instrument's internal shape, which we call the bore. Much of the musical interest in the didjeridu comes not from resonances in the instrument itself, which cannot be changed, but from resonances in the player's vocal tract, which can be changed. During circular breathing, the player alternates between a longer phase during which the air passes from the lungs through the throat to the mouth and to the instrument, and a shorter phase during which the mouth is sealed off from the throat by the palate, while air is simultaneously inhaled through the nose. During this inhalation phase, the sound is maintained by forcing stored air from the mouth and bulging cheeks into the instrument. The two resonators on the player's side of the lips are very different for these two phases: in one, there is a tube leading from the lips to the 'voice box' (the vocal folds) and thence to the lungs. In the other, there is only the closed volume of the mouth. These have very different resonances and, as we shall see, these resonances influence the sound produced. Further, one can change the resonances of the vocal tract by changing the tongue position, for instance a high position (as though saying "ee") or a low position (as though saying "aw"). One can also change the resonances by either relaxing the vocal folds, which allows sound waves to travel almost unimpeded down to the lungs, where their energy is almost completely dissipated, or by nearly closing the vocal folds, putting them in something like the position used for whispering. The latter position produces much stronger resonances in the vocal tract and is often used by experienced players. The interaction of the sound waves in the vocal tract with those in the instrument and with the motion of the lips is interesting and somewhat complicated. We describe it in more detail on the site on didjeridu acoustics, but for our purposes, the important results are these. Because the lip motion is complicated -- the lips close completely for part of each cycle -- it contains many harmonics. In other words, its sound spectrum contains a fundamental frequency f, and many other frequencies 2f, 3f, 4f, etc. A formant is a band of frequencies with enhanced power. Human speech depends heavily on formants, because the way we tell "oo" from "ee" or "ss" from "ff" is because they have different formants. So human hearing (bred and trained to understand speech -- and vice versa) is sensitive to formants and especially to changing formants. So the changing formants in the sound of the didjeridu may 'speak' to something deep in our psyche and evolution... but that's another story. For now, how does the player produce formants in the didjeridu sound? Well, at certain frequencies, the resonances in the vocal tract produce large acoustic pressures at the lips, but very little flow. For harmonics of the lip motion that lie close to the frequencies of resonances in the tract, there is little flow into the didjeridu and so little power in the output sound from the instrument. The harmonics that are not close to resonances of the tract are not much affected. Often, the player's tract has one or two resonances falling in the range about 1 to 2 kHz (1000 to 2000 cycles per second). So the harmonics that fall between these resonances form a relatively powerful band of frequencies called a formant. Speech contains formants in this range, so human hearing is very well adapted to notice them. Much of the information in speech is carried by changing formants, which encode information about vowels and some consonants. Much of the interest in the sound of the didjeridu comes from changing formants in its sound. This is unusual: in flutes, violins etc, most of the interest comes from changing the frequency or pitch of the sound — playing high or low notes. In the didjeridu, the pitch does not change (much), but the timbre* changes regularly, because of the moving formants. You may be able to recognise sounds that are vaguely like "ee", "aw" etc in didjeridu playing. * Timbre is defined in a negative way: it is what distinguishes two notes that have the same pitch and loudness. For most musical sounds, timbre depends on the transients, or the way in which a note starts or finishes, the way in which the note varies over time, and the sound spectrum. For the didjeridu, the spectrum, and in particular the formants, are very important to the timbre. It is also possible to 'sing into the instrument'. In this situation, the vocal tract is excited at both ends: the vocal folds are vibrating at one end, and the lips at the other. Usually, their frequencies are different, let's call them f and g. For technical reasons to do with the nonlinear behaviour of the lips, this results in the production of new frequency components at frequencies f-g, f+g, 2f-g, 2f+g etc. This can give very complicated spectra. The Didjshop has a standard set of ratings used to classify instruments. Their staff and some of the local musicians are familiar with these ratings, so these ratings were used here. For the current case, we shall just discuss the overall quality rating, which the Didjshop rates from 'High Concert' to 'Second Class'. The most important measurement of the instruments was the acoustic impedance spectrum. This is a measure of how easily the air at the mouth end of the instrument vibrates for all frequencies in the range of interest -- here 50 to 3000 Hz. At some frequencies, waves of sound in the instrument can generate large variations in pressure that interact with the lips to play a note: at these frequencies the acoustic impedance is large. At frequencies where this quantity is not large, it is very difficult to play, which is why a didjeridu usually will only play several distinct notes. We calibrated a spectrometer in Sydney, packed everything up and two of us travelled to Kuranda, where Svargo and the Didjshop team kindly made available a sound-treated room in which they do measurements and recordings. Svargo also made available the Didjshop's store of instruments. We measured 38 of their instruments, the number being determined by the time available. As well as these acoustic impedance measurements, we also made some simple measurements such as the length, inner diameters at each end and the pitch of the first two playing resonances. The instruments were ranked on a number of criteria, including overall quality, by seven players with a range of backgrounds and playing styles. For more details, see the technical paper on this study. The first analysis we did was to check that there was some agreement among the different players. The correlation is strong, but of course it is not exact -- different players have different styles and tastes. With measurements of 38 instruments and seven sets of evaluations by players for each instrument, however, it is possible to see subtle effects despite some variations among the players. Here, we shall describe the results qualitatively and shan't give the formal statistics, which are available in the technical paper. The figure at right shows the input impedance spectra for three different instruments. Curve (a) at the top is for the instrument ranked highest overall by the players, (b) is for an instrument ranked in the middle of the range, and (c) that of the instrument receiving the lowest ranking. The quantity MPa.s.m−3 (often called a megohm) is a unit used to measure acoustic impedance or resistance The first peak on the left (a little below 100 Hz in all cases) represents the lowest frequency resonance. A wave in the didjeridu with this frequency can interact with the lips to produce a sustained sound -- the normal or fundamental tone. The next peak(s) correspond(s) to the higher note(s) used occasionally in hoots. Resonances in the range 1 kHz to 2 kHz. As suggested by the discussion above about how the vocal tract is used to vary the timbre of the didjeridu, it is interesting to look at the resonances that fall in the range 1 kHz to 2 kHz. Unlike a piccolo, the didjeridu will not play notes in this frequency range. However, harmonics of the didjeridu sound that fall in this range are important to its sound. The player uses resonances of the vocal tract to control the strengths of these harmonics. To do this, however, he has to compete with the resonances in the instrument. Note that, in this range, the best instrument has no peaks whose value exceeds 1 MPa.s.m−3 (Acousticians often use the term megohm for MPa.s.m−3, appealing to a useful analogy with electricity). The least preferred instrument has several. So does the curve for a piece of plastic pipe of typical didjeridu dimensions (data not shown). It appears that players prefer instruments that do not have strong resonances in this range (which would explain why plastic pipes do not rate highly as didjeridus). In the next graph, the value of the highest impedance peak in the frequency range 1-2 kHz, for each of the 38 instruments, is plotted against their rank (1 being most preferred). The vertical axis is logarithmic, so there is a range of about ten fold. The dashed line shows the correlation. The magnitude of the maximum acoustic impedance over the range 1-2 kHz is plotted against ranked quality. The maximum acoustic impedance is a measure of the strength of the resonances. Among instruments that all play a fundamental note fairly easily, we believe that this is probably the most important single factor contributing to quality. It is not, however, the only one. The first resonance is important because it is used to sustain the fundamental of the note used for most typical didjeridu playing. Obviously, the resonance must be strong enough to do this in a stable way. One way of making the first resonance weaker (reducing the height of the first peak) is to introduce a leak. If the leak is big enough, the instrument will not play the fundamental tone. For all of the instruments we studied, it was always easy to play the fundamental. With one exception, the height of the first peak always fell between 8 and 30 MPa.s.m−3. When we plotted this height against ranked quality, we saw a correlation. Naively, one might interpret this to mean that players preferred instruments with lower first peaks. We suspect, however, that this is not the case, because the height of the first peak is usually correlated with the height of peaks between 1-2 kHz. For example, if we compare pieces of plastic pipe, a narrow pipe has a higher first peak than a wide one. However, it also has stronger peaks in the range 1-2 kHz. In an independent study, players preferred plastic pipes with larger diameters. So we think that players prefer pipes with first peaks that are not very high because these instruments do not have very high peaks in the 1-2 kHz range. Because we were measuring real didjeridus, we did not independently vary the height of the first peak. This is, however, easy to do by simply drilling holes of various sizes in a pipe (or, in principle, a didjeridu!) at a position near the mouth end. The bigger the leak, the lower the first peak. Small holes make hardly any difference to the amplitude of peaks in the 1-2 kHz range. As the hole is made larger, the pipe becomes more difficult and eventually impossible to play as a didjeridu. For this reason, we do not interpret the statistical result mentioned above as indicating that players prefer a low first peak per se. We also looked at various parameters associated with the first peak in acoustic impedance and the rank order, including its 'quality' or Q factor (a measure of how narrow the peak is), and its relation to the characteristic impedance, which may be thought of as a measure of the impedance overall. These effects were not strong. When a cylindrical piece of pipe is used as a didjeridu, the first two resonances allow one to play two notes that are approximately a musical twelfth apart (an octave plus a fifth). Their frequencies are nearly in the ratio 1 to 3, so the frequency of the second resonance almost coincides with the third harmonic of the lower note. On didjeridus made by termites, however, the bore is usually somewhat flared, so the interval is typically a tenth or an eleventh. Whether or not the ratios of the frequencies of resonance are approximately harmonic (as is the case for a cylinder) or not is acoustically significant because resonances that occur at harmonic ratios of the fundamental of the note being played will tend to radiate the corresponding harmonic efficiently: a strong resonance at n times the fundamental tends to produce a strong nth harmonic. We found no significant correlation between the rank order of the instruments and the frequency ratio of the first two resonances, which varied from 2.6 to 3.0 in this sample. We also found no significant correlation with the ratio of the magnitudes of the first two impedance peaks. In our earlier studies of the acoustics of the didjeridu, we saw that resonances in the range 1-2 kHz could have important effects on the spectrum. When a harmonic in this range coincides with a peak, that harmonic is enhanced. By changing the embouchure, ie by changing features of lip tension, mouth shape etc, a player can change the frequency of the fundamental and harmonics of the note played, and can thus cause a particular harmonic to 'scan' over a small frequency range, becoming louder as it passes the frequency of an impedance peak. This, then, gives a method of changing the timbre without changing mouth shape. We call this effect harmonic coincidence. Harmonic coincidence could, in principle, be used by players to enhance timbre changes. So we looked over the 1-2 kHz range to see how ranked quality correlated with both the impedance value at harmonics of the fundamental, and with variation in the impedance at these harmonics as the frequency of the fundamental was varied. There was a clear negative correlation between ranked quality and the magnitude and also between ranked quality and the variation in impedance at harmonics of the fundamental. So, whether or not players use harmonic coincidence in playing, the negative effects of strong resonances in the key frequency range 1-2 kHz are more important. Because of their different lengths and flare angles (see Fig 1), the instruments spanned nearly an octave in pitch, from A1 to G2 (from the second lowest to fourth lowest strings on a double bass or bass guitar). There was no significant correlation between quality and pitch. The instruments studied had internal diameters at the mouth end that varied from 30 to 60 mm, and flares (output diameter/input diameter) that varied from 1.0 to 2.4. There are modest and statistically significant correlations between the internal diameter at the mouth end and the quality (larger diameters somewhat preferred), between the internal diameter at the output end and the quality (larger diameters somewhat preferred) and between the flare and the quality (larger flares somewhat preferred). This makes sense: the acoustic impedance has lower values for larger diameter pipes. A fatter pipe will have weaker high resonances and so, provided that the first resonance is strong enough to support a stable drone, it will be preferred. Similarly, flared pipes have weaker impedance peaks. 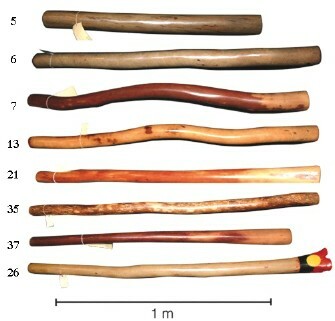 This photograph shows the seven top-ranked instruments from this study. All are ranked from medium-concert to high-concert range by the Didjshop. This photograph shows that fine didjeridus come in a range of shapes and sizes. The photograph at the top of this page shows that there is no simple correlation between appearance and quality. What is more important than shape or size is the strength of the resonances in the range 1-2 kHz. The weaker these are, the more readily you can use the resonances of your vocal tract to vary the output sound, and that is fundamental to both traditional and contemporary performance. Players can produce resonances of the vocal tract with impedances of a few megohms, so instruments whose impedance peaks are lower than this in the critical range allow the player to determine the sounds produced. Several researchers have worked on our didjeridu project (among other things) over the last few years. Why? What if any benefits does it bring? There are several answers. Science is often driven by curiosity, and the didjeridu is a curious instrument. How could a hollow piece of wood -- at the lips of a good player -- make such a range of sounds? The physics was more subtle than we expected. The didjeridu is an iconic Australian instrument. We felt that it was appropriate that its operation should be understood first by an Australian team. (There was some international rivalry.) Several people -- including a physicist who is also a fine didjeridu player, some acoustical physicists and some students all collaborated on this project over a few years. The Didjshop became involved when we sought to understand what made an instrument a good one, and Svargo made available the set of instruments, plus his own extensive data and advice based on his long experience. An important and broader question in music is this: Why do two different players (e.g. a great soloist and a beginner) make a different sound on the same instrument? In the case of wind instruments, the player's vocal tract is involved. If we understood this difference and could clearly explain it to music teachers, it could be important to music education. In the didjeridu, the effect of the player on the sound is most spectacular, so this was a good place to start. In order to understand how the vocal tract was involved, we had to make measurements of acoustic impedance spectra, inside the player's mouth, while he played. This was technically demanding, chiefly because it is so loud in the player's mouth -- the lips radiate sound 'backwards' into the mouth roughly as loudly as they radiate it into the instrument. So we have extended acoustical technology in order to study this problem. We have now extended the technique and are using it to study other wind instruments. The first of these papers is the technical paper that describes, for a technical reader, the work related less formally on this page. That and several other references below are reproduced with kind permission of the editors and publishers. Smith, J., Rey, G., Dickens. P., Fletcher, N. Hollenberg, L., and Wolfe, J. (2007) "Vocal tract resonances and the sound of the Australian didjeridu (yidaki): III. Determinants to playing quality", J. Acoust. Soc. America, 121, 547-558. Tarnopolsky, A, Fletcher, N. Hollenberg, L., Lange, B., Smith, J. and Wolfe, J. (2006)"Vocal tract resonances and the sound of the Australian didjeridu (yidaki) I: Experiment", J. Acoust. Soc. America , 119, 1194-1204. Fletcher, N., Hollenberg, L., Smith, J. and Wolfe, J. (2001) "The didjeridu and the vocal tract" Proc. International Symposium on Musical Acoustics, Perugia. D.Bonsi, D.Gonzalez, D.Stanzial, eds, pp 87-90. 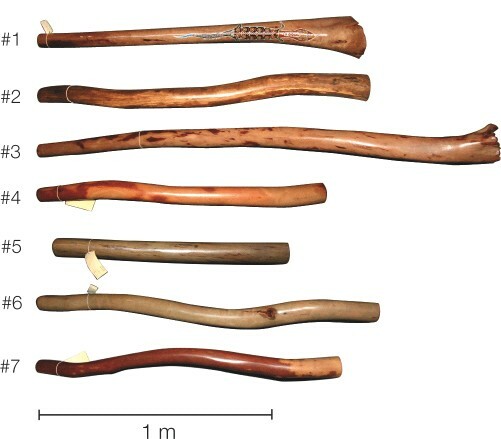 Fletcher, N.H. (1996) "The didjeridu (didgeridoo)" Acoustics Australia, 24, pp 11-15. The Didjshop site has a broad range of information about the didjeridu/ yidaki. Its manager, Svargo Freitag kindly collaborated in this study. Our Introduction to the acoustics of the didjeridu. Home page of William Barton, one of Australia's best known yidaki/didjeridu soloists. This research was supported by the Australian Research Council.